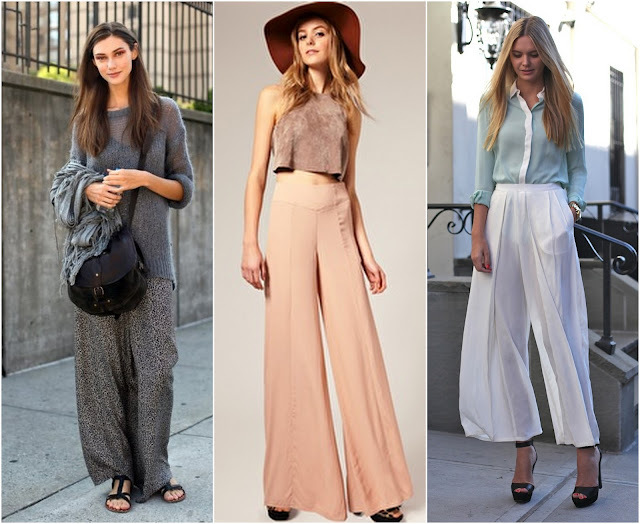 Palazzo pants a.k.a. the ultimate man repelling, most unsexy pants on Earth? I beg to differ. In fact, I think these pants and very chic and elegant. Just make sure to choose in light fabric and simple colour. I'm loving the comfort of flared pants - the bigger the better! Time to take a break from your skin-tight jeans and rock the 70s palazzo! 2. Cropped tops visually shorten the body and help to elongate legs. 3. A well structured collar look classy and chic. Can't go wrong with this one! Lastly, remember to be confident! I wore my basic palazzo with a simple white tee. Accessorizing is so important for this look! I paired contrasting accessories together to colour-block in a subtle way. While accessories are fun, I still wanted all attention on the pant's exaggerated silhouette. I get comments like, "I can't wear palazzo pants because I'm short." These pants will surely elongate your legs. Try wedges and high platforms, and tuck your shirt into the pants for higher waistline. It' easy to cheat your way to longer looking legs. If you are like me who hasn't been running like I should, the loose fit will hide any imperfection.